With 22 schools and a number of day care centers, East Orange School District has a lot going on! 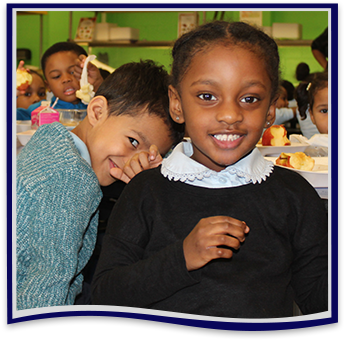 Visit this news page often for the latest on school awards, upcoming events, and important information. We will update this page regularly so you are always informed! Our 2019–2020 school year calendar is now available! We invite you to view our new 2019–2020 East Orange School District calendar. We hope everyone has a safe summer, and we look forward to seeing you next school year! We invite you to take a moment to view our NJSLA testing schedules. We appreciate your time and diligence in helping our students be prepared. Summer vacation means more than just fun in the sun. When students head out of the classroom and take a break from the books, they risk serious summer learning loss that can negatively impact long-term academic achievement. See our stop summer slide flyer and learn about summer slide by the numbers. 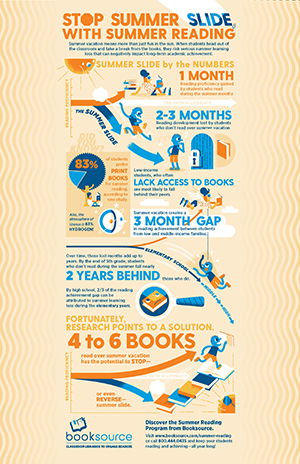 Avoid summer slide and encourage summer reading today! 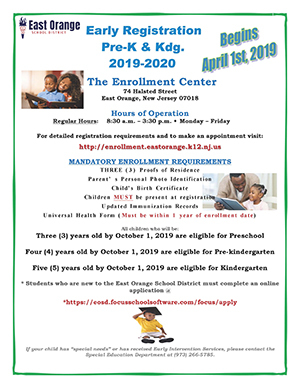 Our East Orange early registration for pre-k and kindergarten begins on April 1, 2019. Join us at The Enrollment Center on 74 Halsted Street in East Orange, New Jersey. The hours of operation are Monday through Friday from 8:30 a.m. until 3:30 p.m. For detailed registration requirements and to make an appointment, please visit the East Orange Enrollment Center. All children three years old by October 1, 2019, are eligible for preschool. Children four years old by October 1, 2019, are eligible for pre-kindergarten. Children five years old by October 1, 2019, are eligible for kindergarten. Students who are new to the East Orange School District must complete an online application. Have a preschool aged student? Enroll them in our East Orange School District free preschool program! We offer preschool classes at 125 Glenwood Avenue, East Orange, NJ, 07017. Special needs and bilingual services. Enroll your child today at our enrollment center located at 74 Halsted St, East Orange, NJ, 07018, 3rd floor. 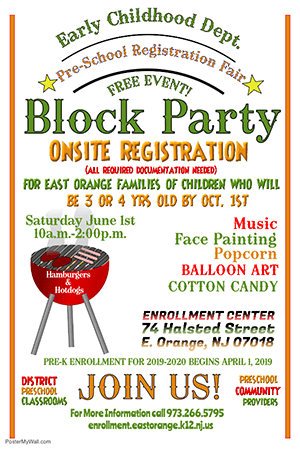 Enrollment hours are Monday through Friday from 8:30 a.m. to 2:30 p.m. Or, attend our Preschool Registration Fair Block Party on Saturday, June 1, from 10:00 a.m. to 2:00 p.m. at the Enrollment Center, 74 Halsted, E. Orange, NJ. For more information on this event please read our block party flyer. In order to enroll your child, they must be three or four years old by October 1. 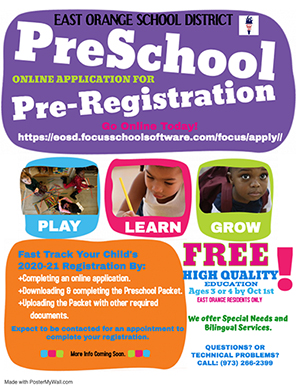 Students who are new to the East Orange School District must complete an online application at Focus School. Registration occurs all year long! For detailed registration information, or to schedule an appointment, please visit the East Orange Enrollment Center, or you can call (973) 266.2399. Project Child Find: If you have or know a child that is three to five years old who has difficulty hearing, walking, talking, or has serious health problems, please contact the Office of Special Education at (973) 266.5785. With so many schools, it can be difficult to stay up-to-date on important news. Here we’ll archive our most recent and past newsletters to help keep you up-to-date and just in case you missed something along the way. Be sure to take a look at our latest edition of the Hart Herald.